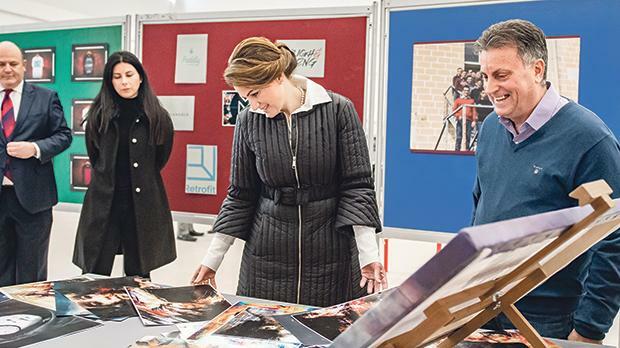 Michelle Muscat viewing students’ work during her tour of the Mcast Institute of Applied Sciences. A corporate social responsibility (CSR) agreement was signed last Friday between the Malta College of Arts, Science and Technology (Mcast) and the Mari­gold Foundation. The agree­ment was signed at the Institute for Applied Sciences on the college’s main campus in Paola by Mcast CEO Prof. James Calleja and the Prime Minister’s wife, Michelle Muscat, on behalf of the Marigold Foundation. Mrs Muscat and Prof. James Calleja during the signing ceremony. During the event Mrs Muscat toured the institute, met students and spoke to Mcast staff. She also visited the college’s youth hub and entrepreneurship centre and spoke with representatives of Aġenzija Zgħazagħ and MOVE, which both have a physical presence on the main campus, where they engage young people in extracurricular activities. The collaborative partnership will enable Mcast students to enhance their educational experience through educational activi­ties of interest to both the college and the foundation. The college launched its CSR programme last month with the aim of providing its students with further opportunities to enhance their studies with life-enriching experiences that add value to their holistic knowledge base with the aim of empowering them to become active and employable citizens. The CSR programme includes a framework whereby any knowledge and skills acquired through it will be recognised and accredited as part of the college’s formal programme of studies.